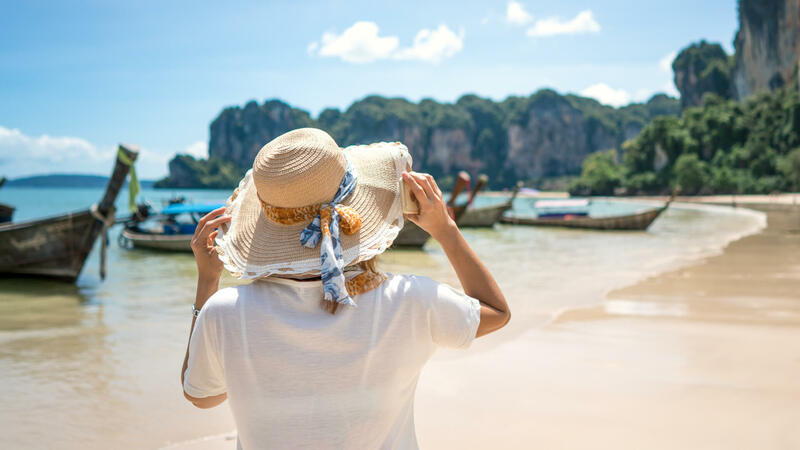 Everyone looks forward to a good vacation, especially the 17 percent of Americans who said in a recent GOBankingRates survey that one of their resolutions is to travel more in 2019. But if you’re like many Americans carrying a hefty amount of credit card debt, you might think you can’t afford to go on vacation. The average American household carries $5,580 in credit card debt, according to TransUnion’s 2018 third-quarter industry insights report. To some people, this amount might seem like too much debt — for others, it’s more manageable. If you’re only making the minimum payments — or if you keep missing payments — on your credit cards, you probably have too much debt. If that’s the case, consider putting your travel plans on the back-burner until you’re able to reduce your debt. Keep reading for tips on how to manage your debt so you can afford the getaway of your dreams. If high-interest debt is keeping you from booking your dream vacation, transfer the balance to a new credit card with a 0 percent introductory APR and balance transfer rate. When you do this, you’re taking the balance you have on your existing credit card, on which you may be paying 20 percent or more in interest, and moving it to the zero-interest card. The BankAmericard Credit Card from Bank of America offers 0% APR for your first 15 billing cycles on any balances you transfer within the first 60 days. And the Chase Freedom Unlimited Card also charges 0% APR on balances transferred in the first 60 days, plus a $150 bonus when you spend just $500 in the first three months. Transferring your balance to a card with a lower interest rate will help pay off your debt faster. Just make sure you pay off as much as you can before the introductory period ends. Reducing your spending is necessary if you want to quickly pay off your credit card debt before you go on vacation. Print out your credit card transactions from previous cycles and see what you can cut back on or eliminate from your budget. Are you paying for subscriptions you don’t really use? Are you using UberEats five times a week? If you take a few minutes to review your spending, you’ll find items within your budget that are nonessential. If you’re able to limit your spending and reduce your debt before your trip, that’s great — but don’t stop there. Before you board the plane, set a budget for how much you will spend while you’re on vacation. Stick to it by finding free attractions to visit and activities to do. Also consider buying food for some meals at the grocery store instead of going to a restaurant. Determine before you leave how much you can spend on your debit card, and how much you’ll have to charge on your credit card. You should also make a plan for how you will pay off your existing debt and any new debt you incur while you’re away. Make sure it’s a plan you can stick to, and figure out how long it will take you to pay off your debt at the rate you’re proposing. Now that you eliminated (or reduced) your credit card debt, it’s time to find a travel destination within your budget. Picking an affordable destination will help you avoid racking up credit card debt when it comes time to book your flight, hotel and more. If you’re thinking about traveling within the U.S., consider one of the best travel destinations for your money in 2019. If none of these destinations interest you, don’t fret — there are plenty of other travel hot spots that won’t put you into debt. You just have to know where to look. Once you pay off or minimize your credit card debt, the last thing you want to do is add a mountain of debt back onto your card when you book your trip. So if you have a travel credit card with rewards and points, take advantage of it. You can use the points to offset the cost of airfare, flights, hotels and more. And if you travel frequently, you might have enough rewards points that you can redeem for free or discounted travel. For example, the Venture Travel Rewards Card from Capital One gives you two miles for every dollar you spend on everything. Plus, you get 50,000 bonus miles when you spend $3,000 in the first three months you have the card, and there’s no annual fee for the first year. Meanwhile, the Discover it Miles credit card has no annual fee, offers 1.5 miles per dollar spent, and they match all the miles you earn in your first year. When using a credit card that offers points or miles, be careful not to buy things you wouldn’t otherwise buy. The best way to get those points or miles is to use your credit card for things you regularly buy, and then pay the balance in full every month. Some cards charge as much as 3 percent for every purchase in another country. That means you’re paying an additional 3 percent on everything you purchase — and all ATM withdrawals — when you’re outside the U.S. If you’re not careful, those fees could eat into your budget and possibly add more debt to your card. When traveling overseas, using the right credit card will save you money on every transaction. Many travel credit cards don’t have foreign transaction fees, but read the fine print to be sure. The Bank of America Travel Rewards Card has no annual or foreign transaction fees. And the Chase Sapphire Preferred Card also has no foreign transaction fee. Whether your dream vacation is a relaxing cruise to the islands or an adventure-packed ski trip to the Canadian Rockies, planning ahead to manage your credit card debt will help you enjoy it even more. Read on to see how to use your credit cards to travel like a pro. It isn't just about reading the fine print.